We can never predict the exact point at which the system transforms. We live in a stochastic world and the final little push out of equilibrium may happen randomly. But what we can say is when the system has become inherently unstable, fragile, vulnerable, ready for small perturbations to trigger critical transitions, in phase transition zone. If we have reasons to suspect the possibility of a critical transition, the analysis of generic early warning signals may be a significant step forward when it comes to judging whether the probability of a transition is increasing. It is hard to be bearish in a bull market, expecting a major sell-off to strike at any moment throughout blue-sky markets. Oftentimes, markets rebound from lows and critical technical levels such as 200 days moving averages, death crosses and flash crashes - in spite of bad fundamentals or blunt evidence of trouble ahead. However, this is no surprise, and actually is typical of other infamous market crashes over the course of financial history. Without exceptions, the worst declines described in the history books were preceded by lower than average volatility, stronger than average earnings momentum, good GDP growth, bullish sentiment and multiple vicious rebounds after early timid declines. Bull traps were visible on the pathways of 1929, 1987, 2000 and 2007, most notably. The signposts of a potential market crash are coming in with increasing hubris. 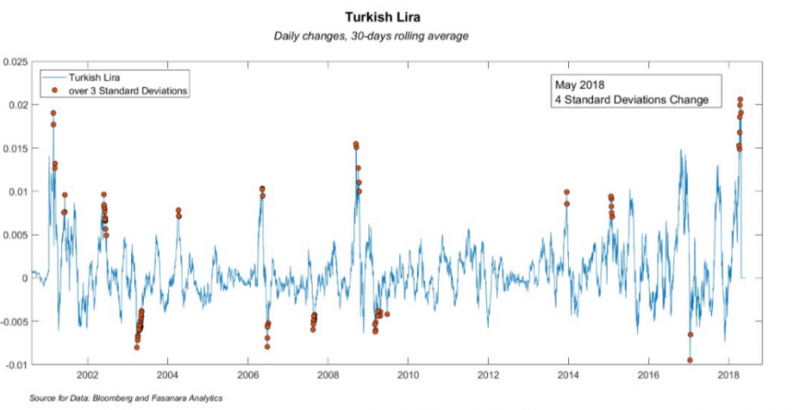 The increasing frequency of VAR-shocks is one such indicator, which comes in confirmation of our broader market assessment of systemic fragility for global markets. 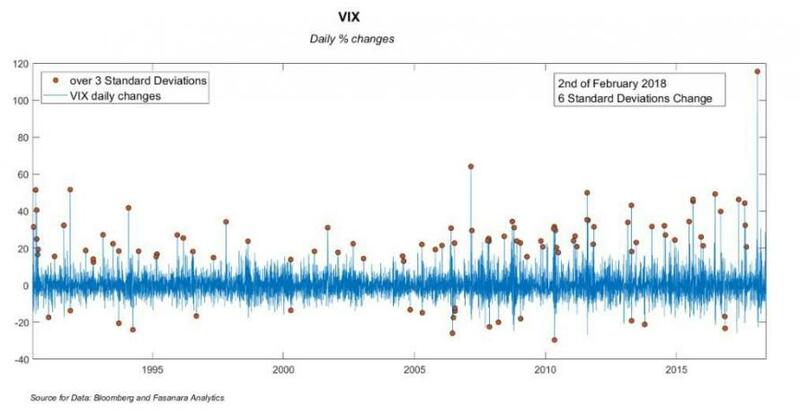 We saw the volatility index VIX ballooning from 9 to 50 in the span of two weeks, while ETP instruments like the XIV were wiped out: more VIX futures contracts were traded in a single day (a quarter of an hour, really) than ever before in history, eclipsing the previous record by a factor of 4. The largest move ever, and an 6 standard deviations move. We then saw the Turkish Lira losing 25% in 2 months (40% in 1 year), only to stabilize at its weakest levels and waiting for delicate election results later this month. The largest monthly move in decades, and a 4 standard deviations move. 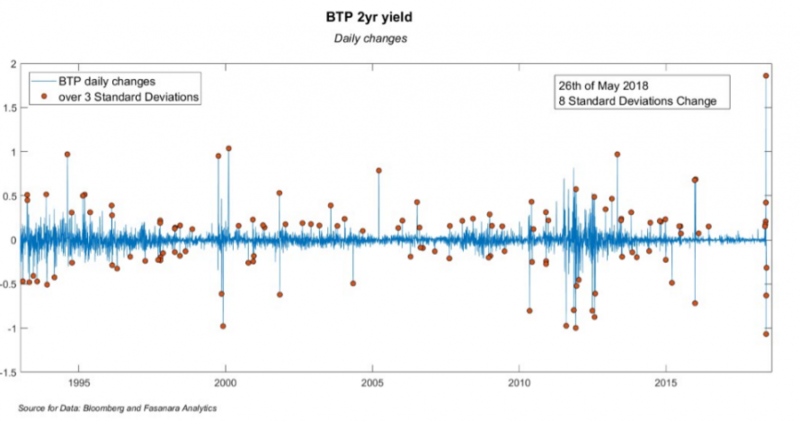 We saw 2yr Italian BTPs moving 150 basis points in one day. The largest daily move in 26 years, and a 8 standard deviations move. 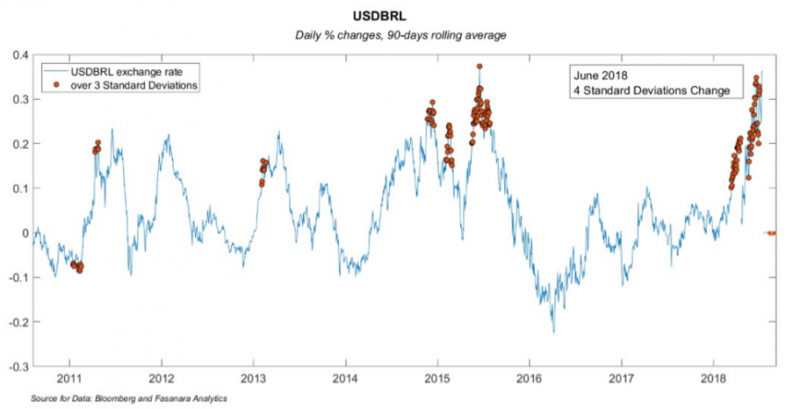 Lastly, the Brazilian Real is is breaking lose at accelerating speed (a 4 standard deviations move), despite Central Bank intervention, and may soon record all-time highs and provide another statistical outlier. The Argentine Peso devalued hard earlier on, despite a market-friendly government and ongoing reforms, before IMF intervention. Beyond the idiosyncrasies of each one of these nutcases taken in isolation, a trend is easy to spot, as they represent early warning signals for system instability of the broader financial network. If this view is right, a critical transition and a moment of final rupture for global markets may then loom ahead. What’s lining up for the next showdown / flash crash? Perhaps heavy hitters? The 2yr Bund yield (still at -0.80% few days ago) on any one or a combination of (i) QE announcements coming up, (ii) Eur-peg prospects after Italy resumes restructuring talks, (iii) Turkey imposing capital controls after elections this month or (iv) Deutsch Bank making the last mile down? The Eur going haywire on Germany realising their dreams around the incomplete EU project are nightmares to other peripheral European countries and too expensive to pursue now that their exposure resumes rising and is set to soon cross Eur 1 trillion on Target II Eurosystem? The S&P and Nasdaq awakening to the vertiginis of all-time highs in profit margins, valuation multiples and system-wide debt? A 2007-style quant quake redux as passive and quasi-passive dominate 90% of daily equity flows, are all long and short vol, and all look at the same signals in unison? CRITICAL SLOWING DOWN: The rate of recovery rate after a small perturbation is reduced, and will approach zero when a system moves towards a catastrophic bifurcation point (less slope of basin of attraction). The difference between now and the fast recoveries of Oct14, Aug15, Jan16, Trump, Brexit may be informative. Calls for further investigation. SKEWNESS OF FLUCTUATIONS: The asymmetry of fluctuations may increase. Rates of recovery are lower. As a result, the system will tend to stay in the vicinity of the unstable point relatively longer than it would on the opposite side of the stable equilibrium. Vicinity to 200-days MA may qualify. FLICKERING / Bi-Modality: In the vicinity of a catastrophic bifurcation, the system goes back and forth between the basins of attraction of two alternative attractors. Such behavior is also considered an early warning. rapid alternations between a cold mode and a warm mode are typical in climate changes over history. In epileptic seizures, smaller transient excursions in the vicinity of an alternative state precede the upcoming major shift. Call them ‘EARLY TREMORS’. Violent rallies seen in bear market about to crash, may qualify. POCKETS OF STRESS: XIV was only the first ETF to go , many could follow (issues of ‘fake diversification’, ‘fake liquidity’ across several household ETFs), Turkey, OIS-Llibor spread / DB, default events, HKD, EU Economic Surprise Index, Italian 2yr BTPs, Brasil. SHIFTING FEEDBACK LOOPS from NEGATIVE to POSITIVE: Critical Transitions Follow Shifts In Feedback Loops: they are likely to be the final stressors. How does the system degrade? How is resilience lost? One such way is with a change in feedbacks. It happens when self-correcting negative feedback loops weaken, and self-amplifying positive feedback loops arise, and the system degrades. Positive loops correlate to an increase in system-level fragility. Now they flipped again to negative: saturation. 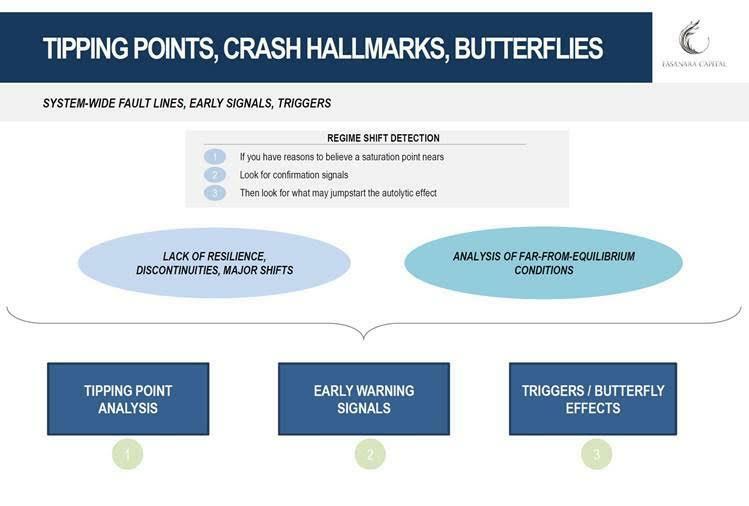 In a critical state, markets are vulnerable to the point that a small disturbance - a butterfly - can trigger a large adjustment: the famous butterfly of the chaos theory, whose wings flapping in Brazil can cause an earthquake in Texas. Here though, there is more than one butterfly in the room. More than butterfly, triggers look like elephants. And more than a room, financial markets look like a china shop (given their fragility, overconcentration and lack of buffers). 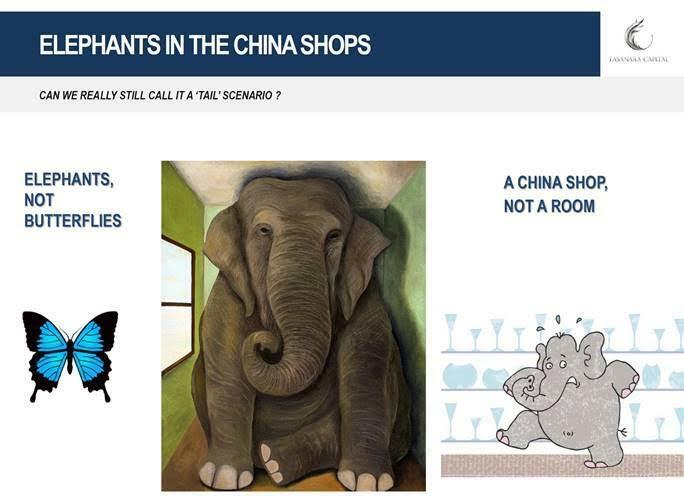 There are then several elephants in the china shop, as regulators hide and markets nap over ever-changing overfitting elusive economic narratives. ENDOGENOUS: STRUCTURE OF THE MARKET. Over-concentrated, across strategies and investors. The autolytic effect already triggered by volatility (chain effect across major market players (Risk Parity funds, Short Vol ETFs, Low Vol ETF, momentum strategies). The rebalancing/deleveraging effect triggered by UP-TREND breaking down. The 200-days moving average is a Maginot Line (same fate). EXOGENOUS TRIGGERS: LIQUIDITY TIDE PETERING OUT. The global liquidity tide from Central Banks is withdrawing. Flows work in reverse, for the first time in 10 years. First real crash test for momentum / volatility. RATES RISING. The cliff is now in sight. It started raining. Over-indebtedness may may be closing in onto its Minsky point. Inflation or Real rates does not matter ! (IL)LIQUIDITY EVENT. The liquidity in markets is deceptive and ephemeral, likely to dissipate as markets move lower. XIV is no isolated case ! Other much larger ETFs exhibit ‘fake diversification’, ‘fake liquidity’. GEOPOLITICS / POLITICS. From populism in developed countries (Germany, Catalonia, Italy, Brexit, Trump) to confrontations in North Korea / Middle East (end of Pax Americana). HOT SPOTS: TURKEY, ITALY, CHINA. Smoking in a gas station. What are weaker FX and geopolitical tensions to Turkey, what are rising rates to Italy, what are trade wars to China? The largest amount of financial leverage to buy assets as % of GDP. The largest indebtdeness in public debt for some of the largest G10 countries in decades as % of GDP. The smallest saving rates for US households in decades. The worst debt metrics for Corporates in a decade. The largest amount of passive as % of daily trading - don’t ask for mercy when the tide turns. Market structure is inflammable, as passive and quasi-passive have dynamically adapted to the local environment of QE-sedated price dynamics across major equity markets and NIRP-impaired price discovery across major bond markets (S&P/Nasdaq and EU/Japan government bonds in particular). The most evanescent liquidity: several studies have identified the market fragility as market makers and passive players left the market during recent periods of stress, with the result of bid-offers blowing out and liquidity drying all up at the same time. All at the same time. Recipe for gap risks. What is a risk is also an opportunity. We stand ready to capture the moment of adjustment as it draws nearer. It may happen faster and more brutally than most anticipate. As Tail Risk disseminated across the financial system, no asset class provides value these days. Relatively better than ugly is still ugly. There is no bull market left out there (Jim Cramer-type), no anti-bubbles to spot (Rob Arnott-type). Be fearful, not greedy. ‘’There Is No Alternative’’ and ‘’There Is No Place To Hide’’ should read/include ‘’from systemic risk’’. Unless you are paid to stay invested regardless (like most institutional accounts / banks), stay out or go short. ‘’It is impossible to spot a bubble’’ and ‘a bubble can be known only in retrospect’, is jargon for ‘I am not paid to spot a bubble’ or ‘bubble has then even better odds of building up’. Human nature is the real driver of crises, invariantly over history. As Fat Tail risk has easily a probability of 25% in 2018/2019, it hardly qualifies as a Tail risk anymore (‘Fat’ yes, a ‘Tail’ no). One which is thus worthwhile positioning for, with the right instrument election. It has been so for 2 years now, despite sugar rush of tax cuts / late stage monetary stimulus / investors positive hysteresis. An opportunity hidden in plain sight. As imbalances have grown to historical peaks, this may be a generational investment opportunity. BE READY, BE PATIENT, BE SHORT. Vol is still low, markets are still close to all time highs, nothing much happened yet. BE CONVEX. Our thoughts are expanded upon in this video slideshow.